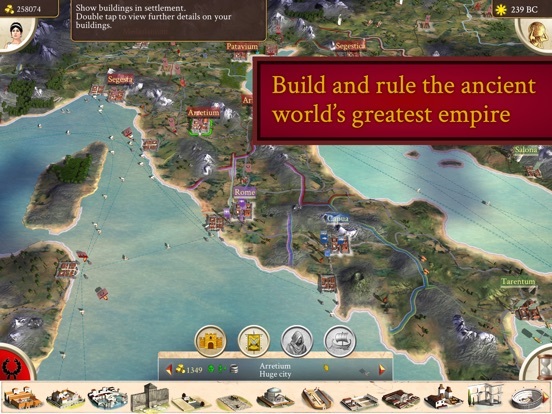 History’s greatest empire, now in your hands. 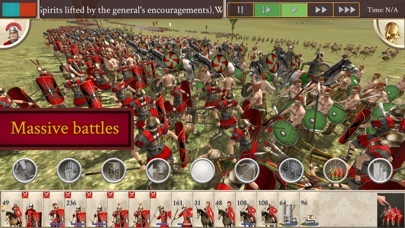 Experience the full glory of ROME: Total War on iOS! 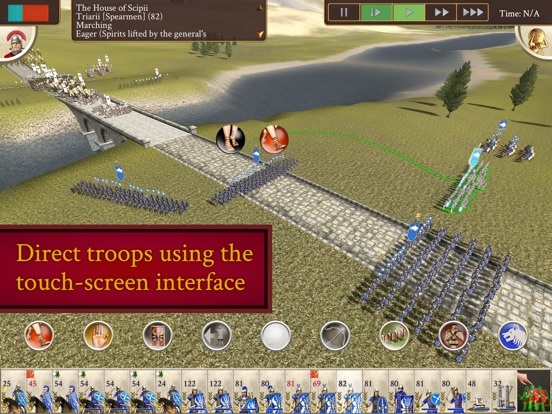 Build and rule the ancient world’s greatest empire by fighting spectacular real-time battles in huge turn-based campaigns. 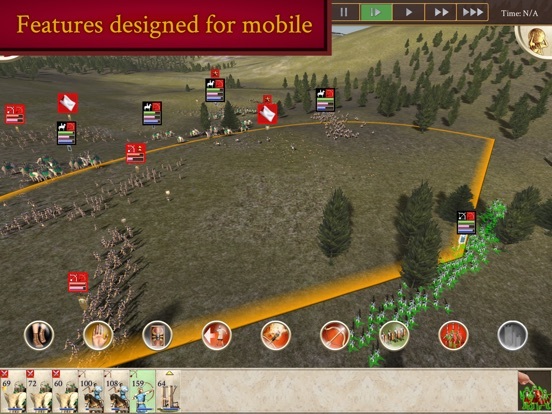 BUILT FOR iOS Play the classic strategy game optimised for your device. 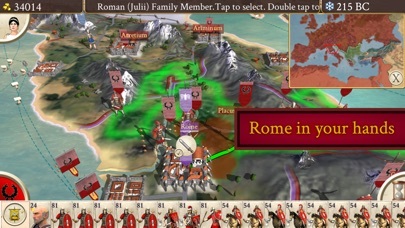 ROME IN YOUR HANDS Rule the largest empire of the ancient world. 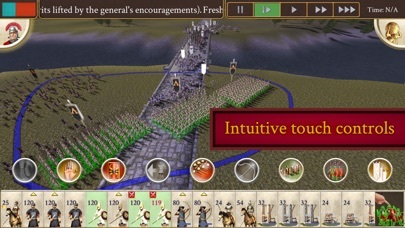 INTUITIVE TOUCH CONTROLS Command your troops with ease using the touch-screen interface. 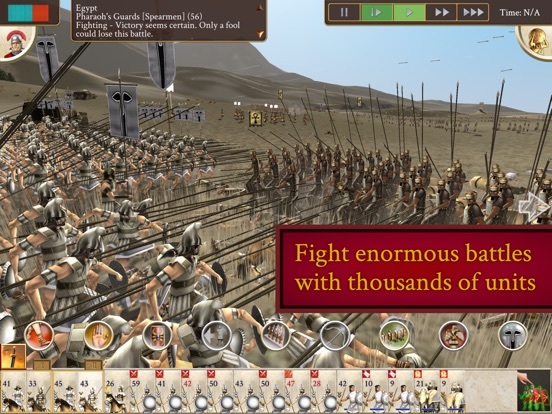 ENORMOUS 3D BATTLES Turn your screen into an exhilarating battlefield with thousands of troops. 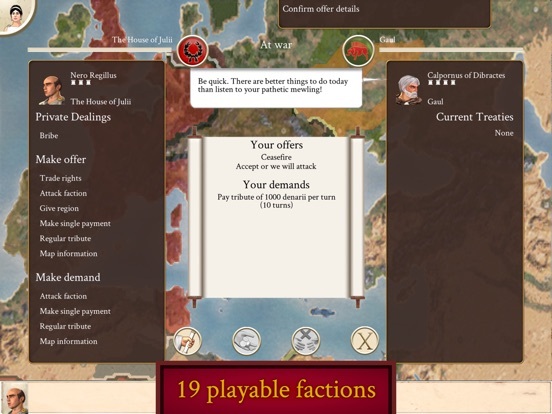 SOPHISTICATED EMPIRE MANAGEMENT Direct your economic, civil and religious affairs from the Campaign Map. This game requires iOS 11 or later and just under 4GB of space to install. Supported iPhones: • iPhone SE • iPhone 5S • iPhone 6/6 Plus • iPhone 6S/6S Plus • iPhone 7/7 Plus • iPhone 8/8 Plus • iPhone X • iPhone XS/XS Max • iPhone XR • iPod Touch (6th Generation) Supported iPads: • iPad Mini 2 • iPad Mini 3 • iPad Mini 4 • iPad Air • iPad Air 2 • iPad (5th Generation) • iPad (6th Generation) • iPad Pro (1st generation: 9.7", 12.9") • iPad Pro (2nd generation: 10.5", 12.9") • iPad Pro (3rd generation: 11", 12.9") © 2002–2019 The Creative Assembly Limited. 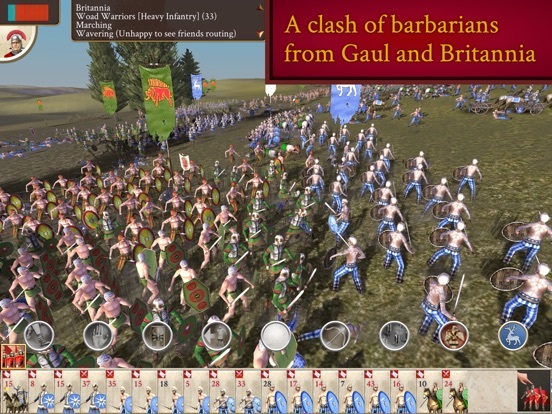 Originally developed by The Creative Assembly Limited. Originally published by SEGA. 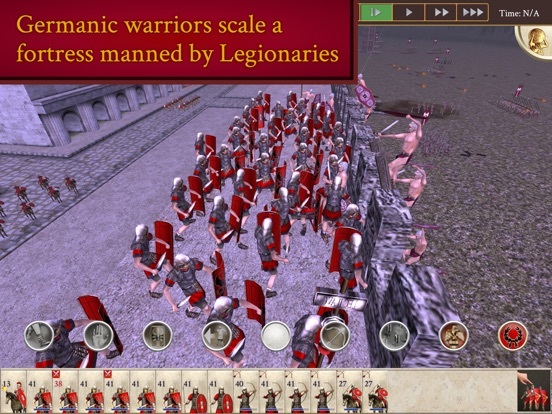 Creative Assembly, the Creative Assembly logo, Total War, Rome: Total War and the Total War logo are either trademarks or registered trademarks of The Creative Assembly Limited. SEGA and the SEGA logo are registered trademarks or trademarks of SEGA Corporation. 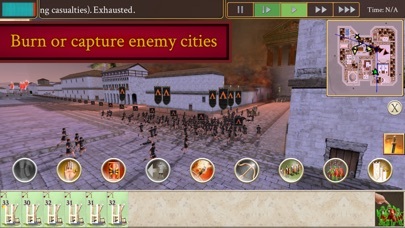 Developed for and published on iOS by Feral Interactive Limited. iOS, iPad and iPhone are trademarks of Apple Inc., registered in the U.S. and other countries. Feral and the Feral logo are trademarks of Feral Interactive Ltd. All other trademarks and copyrights are the property of their respective owners. All rights reserved. First question: how is the control! Who would've thought we'd ever see this day!? And I'm not talking about the election. Thankyou so much Feral Interactive and SEGA. Just downloaded. This is gonna be the best game of the year. Another amazing week on the AppStore. 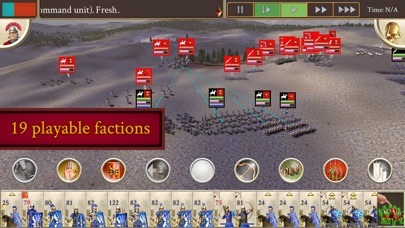 Briefly played a custom battle on the iPad Air 2. I believe I have the medium sized units as pro iPads have the biggest. The game runs smoothly and looks stunning. The controls are all fluid and good but clearly take some time to get used to and master. 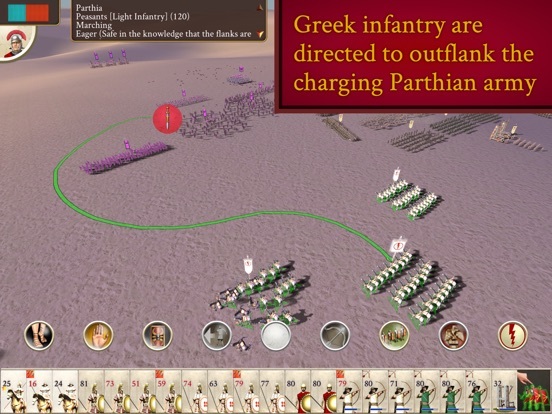 The only problem I have found so far and it is very minuscule is it is sometimes hard to change the shape of your units formation. Besides that I think the game is great. 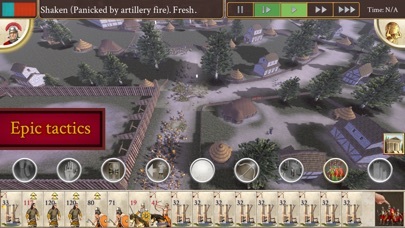 How to swipe and select troops is my main concern, here. Thanks. Omg ***** yes, so I force installed this onto my jailbroken 6+ and right out of the box it runs fine, and widescreens straight to the correct screen size. So of course the text is a little small but it's actually readable. Just giving you guys the news early. I had a quick short go at a quick battle, and movement and selection so far seems workable even on this screen for which the game is not supported. So glad this works! 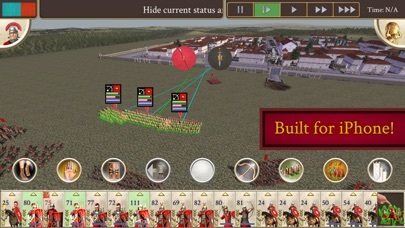 This game was meant for the iPad.....especially the 12.9 version. At least that is the good news for everyone today. I was looking at the installed file size in my memory manager when I noticed this listed as the Gold version, there is no mention of this in the app description. Another jailbroken 6+ here, the game's playable, though I'd definitely recommend an iPad. Anyone in the position to see if it even installs on a 3? 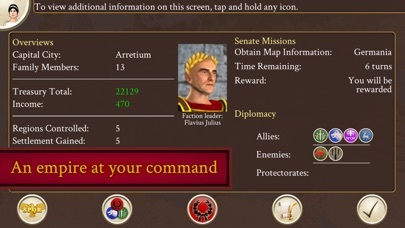 Im sure at least the campaign map is runnable on a ipad3, it's not too intense. 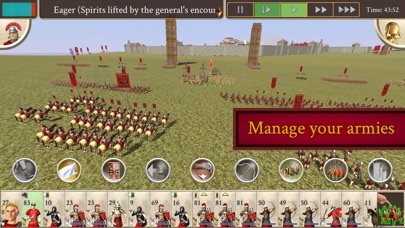 Yeh played some of the tutorial/campaign on my 6+. My eyes have gone funny. I wouldn't recommend it on this screen. Not that the devs ever intended it anyway. I can't for the life of me work out how to get out of the campaign and back to the main menu. The help menu from the top left only talks about a pause button but I cannot even find it, or the one that I press on that the help is talking about does nothing. I'm sure I'm missing something blaringly obvious. Edit: quit out of the game using home button and completely terminated the game from memory. Started up again, made a custom battle and went and tried the pause/save menu button in that battle. Now it's working. Weird it wasn't working in the tutorial. 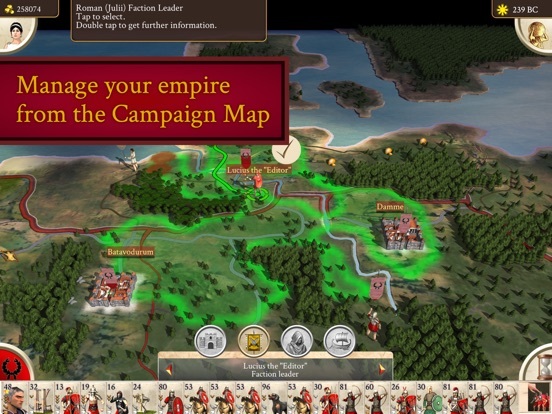 (I think I had completed the tutorial and was now playing a semi-open ended campaign....it doesn't seem to just end, rather leaves it open to you, but for whatever reason, my pause button wasn't working in this scenario. So, no further control issues, right? Even my 256Gb is low (not for this game heheh) for everything i wish there was a TB model as well. I have a 128GB 12.9" and it's that a good amount of space but I would recommend figuring out how often and where you will use the iPad. Normally I get the biggest specs available so it will last me 3 years, but I only found out about the 256GB version a few months after the launch and would have got that because I have a lot of heavy applications. Seriously, I use the 12.9 everyday for work and home and I am hovering at 8GB space left (I had to remove all my Audiobooks) so I am at that point I have to start choosing what to install and remove. 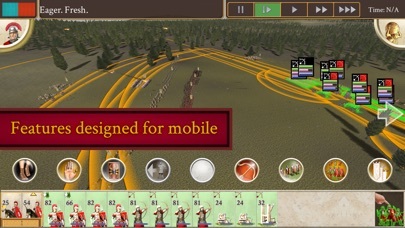 To answer your other question (if you haven't played it already) the controls are comprehensive but intuitive, so it's not a game you can just jump in and play like pinball games, but it works and you can do some complex stuff so far...formations, unit/group info, grouping, set different paths for different groups, quick jumping across the battle map. I think it also helps to have a large 12.9" iPad. 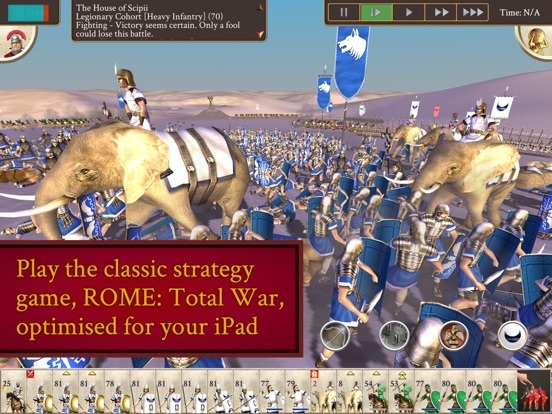 You mean for a more powerfull iPad has a bigger troop unit size? I wanna buy a iPad Pro 9.7" or iPad Mini 4 for playing this game and Football Manager Touch 2017. I love a more portable iPad but iPad Pro" GPU is much powerful than iPad Mini 4. Can iPad Mini 4 run this game well in terms of both control and fluency?